He may be part of a classic dark comedy film (and it might even be titled with his name) but Beetlejuice is one ghost you never want to meet. This trickster is rude and self-serving. He would do everything in his power (and he has many!) to do what benefits him the most, even if that means hurting the people around him. Beetlejuice wears an iconic black and white-striped suit that makes him look like half a salesman and half a prisoner. He has wild, messy, thin, green hair and his complexion is white. 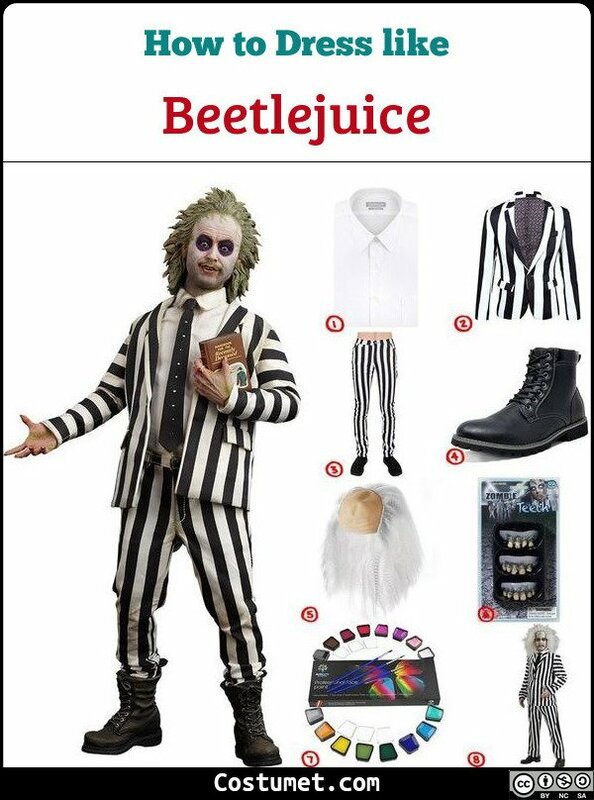 Here’s everything you need to look like Beetlejuice. 1 White Dress Shirt Wear a white dress shirt to contrast Beetlejuice’s peculiar suit. Add a black necktie for a nice added detail. 2 Black and White Striped Blazer Wear this black and white striped blazer to show off Beetlejuice’s quirky fashion sense. 3 Black and White Striped Pants Wear this black and white striped pants to match your blazer. 4 Black Boots Being a busy trickster, Beetlejuice needs a pair of sturdy black boots to wear to work in his afterlife. 5 Messy White Wig Beetlejuice’s hair is super messy and thin. Dye it a bright green to get the authentic Beetlejuice look. 6 Zombie Teeth Beetlejuice’s been dead for quite some time, so having zombie teeth is a given. 7 Assorted Face Paint To get Beetlejuice’s deathly pale complexion and black under eye circles, use face paint. 8 Beetlejuice Full Costume Set If you’re too busy to get each individual piece, why not buy a Beetlejuice costume set? Beetlejuice (or Betelgeuse) is played by talented actor Michael Keaton. He also played Batman in the 1989 film and Ken in Toy Story 3. Beetlejuice wears an iconic black and white-striped suit that makes him look like half a salesman and half a prisoner. He has wild, messy, thin, green hair and his complexion is white. Lydia Deetz wears a red spider web poncho, black boots, gloves, black wig, purple scrunchie, and black and red choker.